For every skin ailment, there seems to be a plethora of beauty products promising to “cure,” “heal,” and “reverse” the problem. And while we’re all for a fantastic power product, chances are, the price tag on such an antidote can be rather costly. Not to mention that so many of these superstar products are formulated with ingredients that aren’t exactly healthy for our skin or our system. That’s why we’re taking our complexion concerns to the kitchen where fruits, oils, oats, and various other cooking accoutrements reside. We’ve rounded up 10 of the very best ingredients for our skin that are likely to be found in the kitchen (if not, they are easily accessible at your local supermarket). While proving to be more cost-effective, these 10 all-natural ingredients are also extremely potent and able to work their magic on your most pressing skin issue. 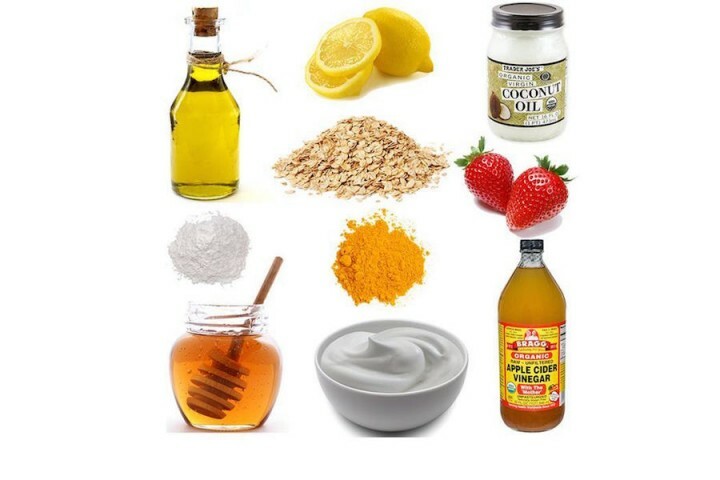 So get cooking, and whip up a few of these wondrous DIY masks, exfoliators, lotions, and potions. 1. Yogurt – Known for its exfoliating, hydrating, and healing abilities, this natural source of lactic acid is a beneficial ingredient for all skin types. Make a quick post-sun mask by slathering Greek yogurt onto your face for 10 minutes. For oilier skin types, opt for non-fat yogurt. 2. Rolled Oats – Yes, like oatmeal. Oats are a fantastic natural exfoliator. Combine with water to create a paste and slough onto your face, or add yogurt to the oats and make a mask that both brightens and heals; this works especially well on sunburned skin. 3. Lemon – Known for its powerful lightening, tightening, and brightening properties, lemon juice is a natural source of vitamin C used to even out skin tone, tighten pores, and lighten sun and age spots. While pure lemon juice is rather potent on its own, you can create a simple toner by adding double the amount of fresh water to the juice. Pour onto a cotton pad and swipe onto affected areas – acne scars, sun spots, blackheads – up to three times a day. 4. Coconut Oil – With its countless beauty uses – face cleanser, moisturizer, hair mask, shaving cream – coconut oil is something you should definitely keep in your bathroom, not your kitchen. Its main skincare benefit is that it is highly moisturizing, but it also deserves love for being anti-inflammatory, antibacterial, and antioxidant-rich. Our favorite way to use coconut oil is as a makeup remover: Apply to dry skin, massage in, remove with a warm washcloth. It removes everything, including stubborn waterproof mascara. 5. Strawberries – This delicious fruit is also a natural source of Salicylic Acid (SA), a common acne-fighting ingredient that cleans out pores, and it’s packed vitamin C to lighten, tighten, and brighten the complexion. To make a DIY strawberry face mask, mash up a couple of strawberries and apply directly to your skin. Lay down and relax, as this can get messy! Remove with a washcloth after 10 to 15 minutes. 6. Honey – It makes a perfectly effective mask all on its own as honey hydrates, repairs, and aids in controlling breakouts (thanks to its antibacterial properties). Or add sugar to create a simple and effective DIY lip scrub! 7. Baking Soda – Baking soda is an amazing all-natural exfoliator that will leave skin incredibly soft and ethereally glowing. Create a paste with equal parts baking soda and fresh water. Apply to face and gently scrub for 5 to 10 minutes. 8. Turmeric – A wonder spice ideal for both anti-aging and acne woes, not to mention its ability to help hyperpigmentation and scarring. To combat aging, create a paste of wheat or rice flour, turmeric, and yogurt; apply to skin until dry. Gently scrub off to increase exfoliation benefits. For acneic skin, create a scrub using turmeric, the juice of a lemon, and a few drops of water. Apply to skin and let it dry for about 10 to 15 minutes; rinse off. To minimize acne scars, make a simple paste of turmeric and water and dab onto the scar; rinse off after 15 to 20 minutes. 9. Apple Cider Vinegar – Choose raw, unpasteurized, and unfiltered Apple Cider Vinegar (ACV) that contains the “mother,” that stringy stuff at the bottom of the bottle. This is where the enzymes, healthy bacteria, and minerals reside. ACV is a natural source of Alpha Hydroxy Acid (AHA), so it’s ideal for problem skin, sun and age spots, and scarring. Create a toner by mixing four parts water to one part ACV. Apply to a cotton pad and sweep over your face morning and night, post-cleansing. 10. Olive Oil – Packed with antioxidants and vitamin E, olive oil soothes and heals cracked skin – from cuticles to elbows. But because its chemical composition is so similar to that of skin’s natural oil, olive oil is an ideal moisturizer for drier skin types. Add a dollop to the face post-wash and… voila!… beautifully, soft skin by morning. Or, add some granulated sugar to create a paste, and you’ve got yourself an ultra-hydrating body scrub. *I originally wrote this article for The Lady Loves Couture. Landing image by Devon Adderly. For more fashion and beauty coverage like this, visit here. For our favorite all-natural pre-made products, click here.